We never like to have problems with our computers, but they are inevitable. Sometimes some of your apps don't work, your Mac gets slow, you get a spinning beachball, and more. Narrowing down the cause of such problems can be difficult; fortunately, however, Apple's Mac offers some troubleshooting tools you can use to diagnose what ails your computer. One of the tools you can use to troubleshoot problems on a Mac is Activity Monitor, a dashboard for many of your Mac's under-the-hood activities. 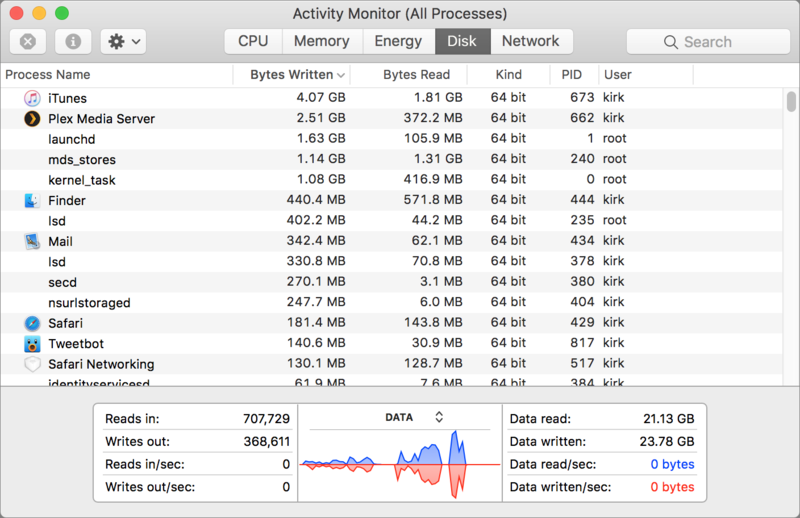 In this article, I'm going to introduce you to Activity Monitor, and explain how this utility can help you find—and, in some cases, resolve—problems on your Mac. 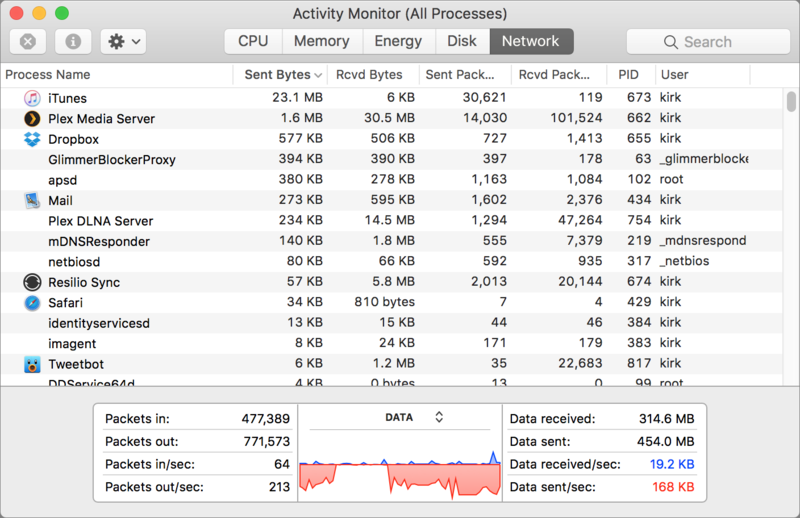 Where is the Activity Monitor on a Mac? 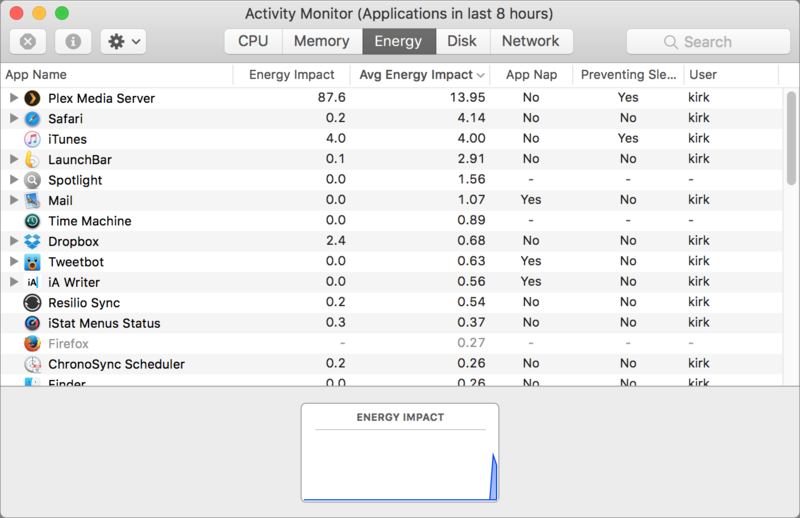 To find Activity Monitor on a Mac, go to your Applications folder > Utilities folder, and then double-click Activity Monitor. There you'll see a simple app with five tabs, and a list of entries that changes every few seconds. 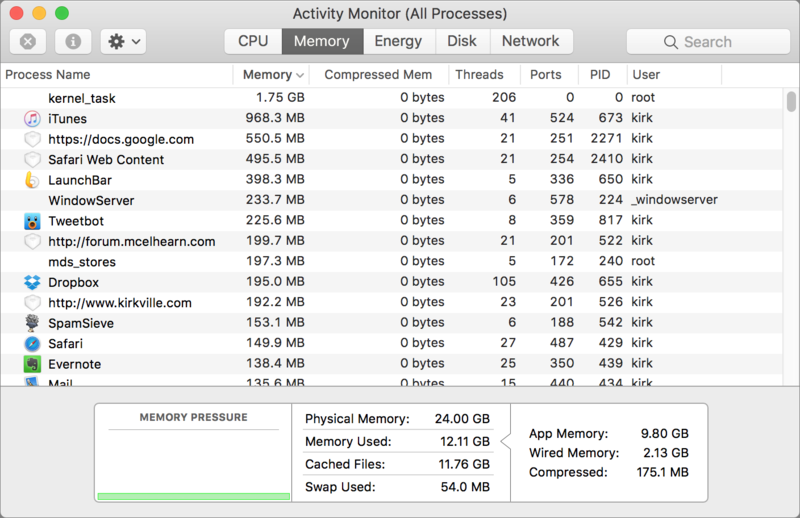 Each of the five tabs inside Activity Monitor keep track of certain aspects of your Mac's performance. There is the CPU tab, Memory tab, Energy tab, Disk tab, and the Network tab. I'll discuss what you can see on each of these tabs and how they might be useful when diagnosing problems on a Mac. The CPU tab shows how your Mac's processor(s) are working. In the above screenshot, I've sorted the list by % CPU, or the percentage of the total available CPU time. 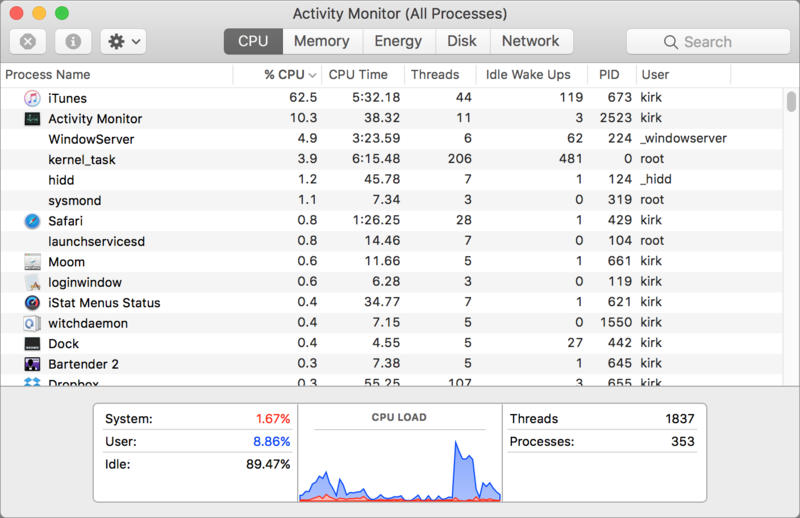 You may see apps or processes that are using more than 100% of CPU time; this is because a Mac with multiple cores (all new Macs) count each core as 100%. This tab lets you know which apps are working the hardest. If, for example, the fan on your Mac becomes loud, or you see the battery on your laptop depleting quickly, check the CPU tab to see which apps are taxing the processor. In some cases, these may be runaway apps that are stuck. If you find an app that's not running correctly—or one that shows in red, with the words "Not Responding" after it—click that app's or process's name, and then click the X button at the left of the toolbar. Activity Monitor will ask if you are sure you want to quit this process. If you click Quit, it will try to quit the app in the normal manner. If this doesn't work, click Force Quit, and, in almost all cases, Activity Monitor will be able to quit the app, removing the offending laggard. This tab gives you an idea of how much RAM your apps are using. You can find the most RAM-hungry apps, and, if your Mac is running slowly, you can choose to quit them. You may even want to find replacements for apps that regularly max out your RAM. Also check the bottom section, where you see Swap Used. Swap files are virtual memory files that are written to your Mac's disk. Reading memory data from these is much slower than reading from RAM, and if there is a large amount of swap space used, your Mac will run slowly. This is a good indication that it's time to restart your computer. If after a system restart you find that your Mac is still running slowly, have a look at our in-depth guide on how to fix your Mac's performance issues. The Energy tab tells you which apps and processes use the most power. For a desktop Mac, this isn't very important, but if you're seeing poor battery life on a laptop, this is the place to check. The Energy Impact column updates regularly, and it shows the current power usage, but this varies a great deal depending in which apps you use. The most important column is Avg Energy Impact. This shows which apps use the most power over time. If your laptop's battery life is insufficient, check here to see if you're using an app that's depleting the battery. This can be a good way of deciding which web browser to use on your laptop. You might try using, say, Safari, Firefox, and Chrome, each for a few days, to see which one uses the least amount of power. Most users don't need to worry about the Disk tab. This shows how much data is being written to and read from your Mac's drives. This information could be important if you're running a server, and you need to keep an eye on input and output, but average users can just skip this. This tab shows how much data is entering and leaving your Mac over its network interfaces for active apps and processes. You can sort by Sent Bytes, Rcvd Bytes, Sent Packets, or Rcvd Packets. If you have trouble accessing the Internet, there can be numerous causes. Some have to do with your connection, but your network access can also slow down if there's a lot of data coming into or leaving your Mac. For example, your upstream bandwidth is most likely lower than your downstream bandwidth. If the former is saturated, you'll find that even loading simple web pages can be painful. But don't just look at those Sent Bytes or Rcvd Bytes columns; they show totals since the last time you launched each app or the last time you restarted your Mac, for system processes. Instead, focus on the information displayed at the bottom right, at Data received/sec and Data sent/sec. Those numbers will give you an idea if you're sending or receiving a lot of data. You can then check the totals by app, and monitor them to see if they increase. Check the Sent Bytes to see if your upstream bandwidth is being used, and your Rcvd Bytes to see if downstream bandwidth is used. Note that if you want to find out if there's any excess data usage for Safari, this data is listed under the process Safari Networking, not the Safari app itself. While it's easy to see what's using data among apps that access the Internet, don't forget that you'll see a lot of data being moved across your local network if you have more than one computer and transfer files between them. The Network pane shows all your network activity, not just to and from the Internet. 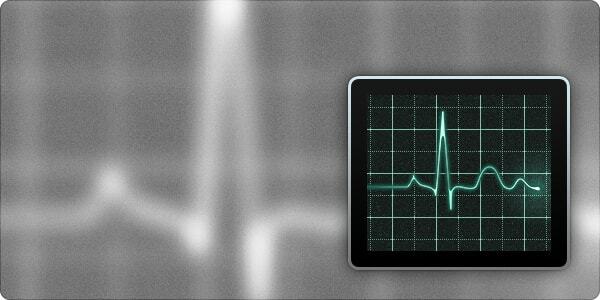 Activity Monitor is just one of the useful tools on a Mac that can help you troubleshoot problems and keep your computer running smoothly. We'll have more articles about other great Mac utilities in the future, so stay tuned! This entry was posted in How To, Software & Apps and tagged Activity Monitor, Mac, troubleshoot. Bookmark the permalink. so i have stop using safari cuz of the spinning ball, using chrome. going back to safari, what do i look for in the activity monitor when when the spinning ball comes back?